J. S. Keater & Sons log mark was the letter K, enclosed in a diamond, the end mark was the same, and was known as the diamond K mark. This is very difficult to decipher, could be Mrs. A. Kees or Keyes or Mrs. M. Karr or Kerr but only reference to Kees was found. Since Alice Kees was a teacher at one time and might have owned property where Hemlock school was located the following is only a guess as to who owned the property in 1906. Also checked "Kern" but no "M" in the Kern family and the Kern lived in Warner sec 34 as did Alice Kees' daughter Mable Kees Bredesen. Mrs. Ingi Johnson was born Dec. 20, 1847, in Skrudvold, Valders, Norway. She died Sept. 23, 1929. She was married to Andrew Johnson July 17, 1878. They came to America in the year 1882 and settled in Moscow, Iowa Co, where they resided until the spring of 1903, when they moved to Greenwood, Clark Co, where they have since made their home. To this union seven children were born, of which four are dead, namely Halvor at the age of four years, Beata at the age of two years, Bertha at the age of one and one-half years and Johnie at the age of fourteen years. Those living are Henry Johnson, Mrs. Annie Dahlby (later m. George Vollrath) and Edwin Johnson, all residing here. One brother, Knut Holverson, and one sister, Mrs. Engebret Knutson, both of Mr. Horeb, Wis. Those from out of town who attended the funeral were Mr. and Mrs. Egebret Knutson and son Henry and Knut Holverson all of Mt. Horeb; Mr. and Mrs. John Heggesta of Hixton and Mrs. Carl Kellisvig and son Raymond of Blair. Funeral services were held from the United Lutheran Church. The body was laid to rest in the Greenwood Cemetery. Peter Dahlby, a well known and high respected citizen, died March 17, 1916, after a long and lingering illness. The funeral was attended by a large number of friends, and interment was at the Greenwood Cemetery. The deceased is survived by a wife (Annie Josephine nee Johnson who next married George Vollrath) and three small children (Eleanor, m. James Plank; Alvera b. 30 July 1911, d. 10 Dec 1995, m. Durward Schwarze; Ortan Arvin Dahlby b. c1914, d. 22 June 2003). His mother, Mrs. E. E. Helland of Duluth, Minn., was a constant attendant during his illness. Two sisters, Mrs. E.J. Lauthier of Duluth, Minn., and Mrs. H. Kellesvig of Mt. Horeb, Wis., were present at the funeral. In addition to the Warner township property, a lot of other property in CC was listed as belonging to "Kennedy & Stewart". A search of the various logging and timber associations failed to reveal which Kennedy or Stewart this partnership was made up of. After researching the families of the two names the following Daniel Kennedy and John Stewart best suited such a partnership although neither had reference to such a partnership let alone to each other in their bios or obits. Only the Clark Co RE records would reveal the truth of the matter, barring future site postings in that regard. Daniel Kennedy, one of the oldest residents of Clark Co, died at his home in Neillsville, Sept. 12, 1913, after a lingering illness of more than a year. He was born at Presque Isle, Aroostook Co., Maine, Oct. 20, 1844, and came to Clark Co in 1866. He at once entered the employ of C.L. Coleman, one of the leading loggers on Black River, and remained in their employ the rest of his life. In late years, since active logging operations ceased, he looked after their lands. He was married June 10, 1879 to Miss Lillian Marshall, in Neillsville, and they have made their home here ever since. He leaves his wife, and two daughters, Miss Elizabeth Kennedy, County Superintendent of Schools, and Mrs. Gertrude McIntyre. The fact that he was the trusted agent of a large lumber firm for forty-seven years shows the estimate held of him by those closest to him in business. The funeral was held at the home under the auspices of the Free Masons, of which order he had been many years a member. John Stewart, at one time a prominent citizen of Clark Co, Wis., died on May 31, in Portland, Oregon. He was a member of the County Board of Supervisors of Clark Co, Wis., for several years. Deceased was born in Glasglow, Scotland, October 3, 1844, emigrated to Canada in 1858, thence to Michigan in 1864 and to Wisconsin in 1866. His wife preceded him in death a few months ago. She was a sister of Mrs. Margaret Shanks and Eugene McMahon of Greenwood, Thomas McMahon of Prescott, Arizona, Mrs. Agnes Mead of Berkley, Calif., and Mrs. Mary Root of Neillsville. He leaves two sons, Dr. J. Arch Stewart and David Stewart both of Portland and two daughters, Bernice of Portland, Oregon and Elizabeth of Santa Monica, Calif.
Word was received here of the death of Mrs. John Stewart at her home at Portland, Oregon, Dec. 31st, 1924. Deceased was well known here in Greenwood, Clark Co, Wis. especially by the older residents. The family resided at Greenwood and were among the pioneer settlers here where Mr. Stewart was engaged in lumbering. At the time they resided here they owned the Armstrong residence. They left Greenwood about twenty eight years ago. She is survived by two sons, Dr. Archibald Stewart and Dave Stewart a lumberman, both of Portland, two daughters, Mrs. McKenzie of New York and Mrs. Ferguson of Los Angeles, Cal., three sisters, Mrs. John Shanks of Greenwood, Mrs. Root of Neillsville and Mrs. Mead of Berkley, Cal., two brothers, Thomas McMahon of Prescott, Arizona, and Eugene McMahon of Greenwood. Henry F. Kern was born on March 23, 1828 at Altwidermos, Besse-Darmstadt, Germany. He came to this country in 1853 and settled in Philadelphia, Pa, where he was united in marriage to Miss Johanna Mann. (11 April 1834 - 5 April 1893, daughter of George and Margaretha nee Ehrenfeucher Mann)This union was blessed with ten children, six of which died in infancy. In 1879 he and his family came to Clark Co., Wis, and settled on the farm on the West Side (Warner township) where he resided till his death on March 4. He reached the age of 83 years, 11 months and 10 days and always enjoyed good health till the middle of November last year. Since then his health has declined rapidly. Service was held in the German Reformed Church on the West Side with burial following. The deceased leaves to mourn his death two sons and one daughter in Duluth, Minn. one son, George, here. Mrs. George Kern, 92, died of a heart attack Oct. 27, 1966 in the Memorial Hospital at Neillsville. Services were conducted at Hill Funeral Home in Greenwood. Burial was made in the Riverside Cemetery at Withee. The former Lena Sundemeyer was born in Germany on Aug. 29, 1874, and at the age of 5 years came with her parents (Kasper Heinrich and Lina nee Winter Sundermeyer) to the United States. The family settled in Sheboygan and two years later moved to a farm northwest of Greenwood, Clark Co. 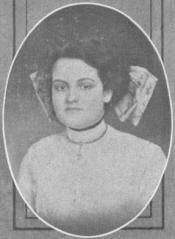 Her marriage to George Kern, (born 27 Dec 1871)who preceded her in death Aug. 24, 1962 took place Jan. 22, 1896, at Greenwood. After their marriage, the couple made their home in the Greenwood area. Survivors are five sons, George H. (George Heinrich, Jr. born 25 Feb 1897), Marshfield; Clarence (3 Oct 1901 - 14 Oct 1986), Georgetown, Minn.; William (born 22 May 1899), address unknown; Theodore (1911-1994 obit) and Edward (1903-1993 obit), Greenwood; four daughters, Miss Rose (born 4 Aug 1909) Kern, Greenwood; Mrs. Otto (Mabel born 2 June 1906) Moldenhauer, Mrs. Leonard (Hazel) Mueller, and Mrs. Violet Seroski, Chicago; a brother, William Sundemeyer, Groton, S.D. ; three sisters, Mrs. Fred (Jennie) Clocksene, Groton, S.D. ; Mrs. Minnie Glau, Seattle, Wash.; and Mrs. Marie Meinhardt, Greenwood. She was preceded in death by two brothers, a sister and two granddaughters. Eddie E. Kern, 89, Greenwood, died Oct. 31, 1993, at Neillsville Memorial Medical Center, Neillsville. Funeral services were held at Rinka Funeral Home, Greenwood. Burial was in Riverside Cemetery, Withee. Eddie E. Kern was born Dec. 19, 1903, in Greenwood, to George and Lena (nee Sundermeyer) Kern. He received his education at Decker School in the Township of Warner. As a young man, he worked in the harvest fields in North Dakota during the summers. He then farmed on the family farm and his own farm until his retirement in 1978. He resided in Greenwood until entering the Memorial Nursing Home in October 1993. Survivors include one brother, Ted Kern, Greenwood; four sisters, Mabel Moldenhauer, Appleton; Hazel Mueller, Arlington Heights, Ill.; Violet Seroski, Belvidere, Ill. and Rose Kern, Greenwood. He was preceded in death by his parents and two brothers, George and Clarence. Theodore "Ted" Kern, 82, Greenwood, died July 1, 1994, at Neillsville Memorial Hospital. Funeral services were held at Rinka Funeral Home in Greenwood. Burial was in Riverside Cemetery. Theodore Alvin Kern was born Nov. 15, 1911 in Greenwood to George and Lena (Sundermeyer) Kern. He received his education at Decker School in the Town of Warner. As a young man he worked in the harvest fields of South Dakota during the summers. He also worked in the iron ore docks in Duluth, Minn. and for the Railroad in Minnesota. He also worked at the Union Station in Chicago. He then returned to Greenwood and farmed on the family farm until his retirement in 1978, at which time he moved to Greenwood. Survivors include four sisters, Mabel Moldenhauer, Appleton; Hazel Mueller, Arlington Heights, Ill.; Violet Seroski, Belvidere, Ill. and Rose Kern, Greenwood. He was preceded in death by his parents and three brothers. Mr. George Kern and Miss Selma Mohs were united in marriage at Plymouth on Sept. 23, 1922. The groom is a son of Mr. and Mrs. Geo. Kern. They will make their home at Owen. Announcement has been made of the wedding of Miss Violet Kern of Chicago, Ill., daughter of Mr. and Mrs. George Kern, Jr. Greenwood and Allen Seroske, also of Chicago. The ceremony was performed at Clinton, Iowa, on Feb. 8, 1941. Mr. Seroske is employed as an electrical inspector in Chicago and the bride has also been employed there during the past three years. They will make their home on the North Side of Chicago. Miss Hazel L. Kern, Chicago, daughter of Mr. and Mrs. George Kern, Jr. Greenwood (Clark Co., Wis.), became the bride of Leonard J. Mueller, Oglesby, Ill., son of Mr. and Mrs. Eugene Mueller, Chicago, in a ceremony performed in LaSalle, Ill., on April 25, 1942. Miss Florence Mueller, Oglesby, sister of the groom, and Fred Politz, were the only attendants. Mrs. Mueller was graduated from the Greenwood High School with the class of '34 and has been employed in Chicago for the past five years. Mr. Mueller is superintendent of a defense factory school in Oglesby, where the couple will reside. Miss Lorraine Kern, daughter of Mr. and Mrs. George Kern,Jr. of Pittsville, exchanged wedding vows with Richard L. Markee, son of Mr. and Mrs. John Markee, Pittsville, in a nuptial ceremony performed in the Methodist Parsonage at Marshfield. Mr. and Mrs. Roger Stebbins of Pittsville were the only attendants. A luncheon was served at the home of the bride's parents, and was attended by Mr. and Mrs. John Markee and Mr. and Mrs. William Krutz of Pittsville, and later a reception and dance were held in the Cary Town Hall. On Thursday the couple left for Chrystal Lake, Ill., where they will reside. The groom is engaged in farming and Mrs. Markee is employed in a war plant. The Kern family resided in Braun Settlement (Clark Co., Wis.) about 5 years ago and Mrs. Markee is a granddaughter of George Kern, Sr. Route 2. 1905 #124 Ketchpaw, Byron Head W M 48 M Wisconsin NY/Canada Farmer 8 O M F Ella Wife WF 47M Wisconsin Engl/Ireland House Keeper Marcel SonW M20 SWisconsin Wisconsin Farm Laborer 8Eben SonW M15 SWisconsin Wisconsin Farm Laborer 8Beatrice Daughter W F 13 S Wisconsin Wisconsin. Death came to Byron F. Ketchpaw aged 82, at his home October 19, 1939 following an illness dating back approximately one year, but which had only confined him to his bed about ten days. He was born in Elkhorn, Wisc Sept. 28, 1857 the youngest of five children, the son of Mr. and Mrs. Jacob Ketchpaw. In 1877 he was married to Ella Roach of Elkhorn. In December 1897 he, his wife and family moved to Greenwood and the following March to a farm about five miles northwest of town. In 1912 they moved back to Greenwood, where they have since resided. During his many years of residence in this community, he gained a wide acquaintance and made many friends. He was known as a genial, hospitable man with a keen sense of humor, who was devoted to his family and kind to everyone. He took his recreation in hunting and fishing, was an all around nature student, an excellent marksman, was quite an authority on birds, and had a keen interest in, and considerable knowledge of the planets and the constellations. He leaves to mourn his loss, his wife, Mrs. Ella Ketchpaw, two sons and three daughters, Maude, Mrs. C.A. Dustin of Everett, Washington, Dr. Marcel Ketchpaw of Bloomer, Wis.; Mrs. Addie Memhardt, Mrs. Beatrice Clayton and Eben Ketchpaw, all of Greenwood. Those from out of town who attended the funeral were Mr. and Mrs. G. L. See, Mrs. Donald McIntosh and Wm. Roach, Chicago Mr. and Mrs. E. A. Roach, Mrs. A. Dullam of Harvard, Illinois Mr. and Mrs. Ed Wolf of Knapp, Wis. L. G. Ketchpaw, Menomonie, Wis.
Funeral services for Mrs. Ella E. Ketchpaw, 92, were held at the Ketchpaw home and at the Grace Methodist Church. She died at her home in the city Mar. 18, 1950. Burial was made in the Greenwood Cemetery. Mrs. Ketchpaw, nee Roach, was born in Elkhorn Oct. 14, 1857. She was married there to Byron F. Ketchpaw Dec. 4, 1877. The couple lived there until 1897, when they came to the Greenwood vicinity. She had resided in the city for the past 38 years, and was well known as an active church and Sunday school worker in this area. She also was a member of the Greenwood Chapter of the Order of Eastern Star. Surviving children include Mrs. Addie Memhard, Greenwood; Mrs. Maud Dustin, Everett, Wash.; Mrs. Beatrice Clayton, Greenwood Dr. M. B. Ketchpaw, Bloomer and Eben Ketchpaw, Greenwood. Her husband, two sisters, and three brothers preceded her in death. February 15, 1906: Mrs. Byron Ketchpaw and Beatrice visited at Geo. Warners the evening of the 6th. Greenwood cemetery: Beatrice Ketchpaw Clayton, 18 Feb 1892 - 14 Sept 1972, d. Everett, WA source = obit but none found on CC site. 1907 Township Officers for Warner: Constables--A. Johnson, B. F. Ketchpaw, S. J. Smith and Geo. Harlow. Funeral services were held at the Hill Funeral Home for Mrs. Addie J. Memhard, 81, who died Sept. 27, 1959. The pastor of Grace Methodist Church, officiated. Burial was made in Greenwood Cemetery. The former Addie Ketchpaw was born Sept. 1, 1878, at Elkhorn and received her education in Elkhorn schools. The family moved to Greenwood in 1897. She was employed here as the first cashier in the Big Store, now the Farmers Store. Several years later she went to Chicago, Ill., where she was employed by a wholesale credit company. She was married to John Memhard of Chicago, Jan. 26, 1911. Soon after their marriage they went to Twin Falls, Idaho, where they purchased a store. A few years later they returned to Chicago and engaged in business there. After some time they sold their business and returned to Idaho and were in the dry goods business at Bancroft, Idaho, until Mr. Memhard's death in March 1939. In 1939 she came to Greenwood to make her home with her parents and sister, Mrs. Beatrice Clayton. She was a member of the Soda Springs Chapter, Order of the Eastern Star, Soda Springs, Idaho. Herbert White and Miss Maude Ketchpaw were quietly married in the home recently purchased by Mr. White June 26th, 1901. Immediately afterwards a reception was given at the home of Mr. and Mrs. A.M. White, which was attended by nearly a hundred. Mrs. Claire Darton Niehoff of Loyal (Clark Co., Wis.) and Dr. Marcel B. Ketchpaw of Bloomer, were united in marriage on Nov. 11, 1944 at the home of the bride's parents, Mr. and Mrs. Arthur Darton at Loyal. Pastor of the First Congregational Church of Bloomer, officiated. The bride was attended by Harriet Ketchpaw of Ripon, daughter of the groom, while Hugh Darton, brother of the bride, was best man. About 60 relatives and close friends of the bride and groom were present at the ceremony and a large number of guests attended the reception given later at the Johnston Hotel in Loyal. After a short honeymoon they will be at home to their many friends in Bloomer. Claire Ketchpaw, 90, Bloomer, died April 28, 1990 at Bloomer Memorial Hospital. Funeral services were held at First Congregational Church, Bloomer. Graveside services followed at Loyal Cemetery, Loyal, Clark Co. Claire (Darton) Ketchpaw was born Nov. 24, 1899, in Clark Co to Arthur and Olga (nee Rossman) Darton. She graduated from Madison Business College and taught school in the Loyal area for a number of year. She married Dr. M. B. Ketchpaw in Loyal on Nov. 11, 1944. She was employed at the Clark Co Heath Care Center Owen and later worked as a bookkeeper for Kostner and Kostner Attorneys and the Abrahamson Insurance and Auto Agency in Bloomer. Survivors include one step-daughter three step-grandchildren and four great-step-grandchildren. Preceding her in death were her parents, husband Marcel one son, Roger Niehoff and brother Hugh Darton. 1938 Greenwood High School Year Book Supporters:Ketch's Tavern, E. L. Ketchpaw, Prop. Miss Bonita Voight, daughter of Mr. and Mrs. Adolph Voight of the Town of Loyal, and Mr. Lynn Ketchpaw, son of Mr. and Mrs. E. L. Ketchpaw, Greenwood, were united in marriage October 25 at the Trinity Lutheran Parsonage, Loyal. She was attended by Hope Ketchpaw of Chicago, Ill., sister of the groom, as maid of honor. Arthur Voight, brother of the bride, attended the groom as best man. After the ceremony a reception was held at the home of the bride's parents to immediate relatives. Those from out of town attending the reception were: Mr. and Mrs. E. L. Ketchpaw, Greenwood; Miss Hope Ketchpaw, Chicago, Ill., and Mr. and Mrs. Harry Frantz, Neillsville. The newlyweds will make their home in Greenwood where the groom is employed by his father as bartender. Mr. and Mrs. E.L. Ketchpaw, Greenwood announce the marriage of their daughter Hope to Lawrence Kuester, son of Mr. and Mrs. William Kuester, Greenwood, Dec. 30, 1941, in the rectory of the Holy Ascension Church. A reception was held that evening at the Parkway Club, Greenwood for relatives and friends. Mrs. Lawrence Kuester, age 66, of St. Louis, Mo., passed away Sept. 26, 1977 at St. Louis, after a lingering illness. Mrs. Kuester was the former Hope Ketchpaw of Greenwood, Clark Co. She is survived by her husband, Lawrence, two daughters, Mrs. Dayne (Patricia) Jenson, and Mrs. Kenny (Mary Lou) and her mother, Mrs. Eben Ketchpaw, all of St. Louis, and one brother, Lynn, of Hatfield. Burial services were held at St. Louis. Adam Kippenhan married Magdalena Richter (24 Aug 1824 - 19 Aug 1890) on 26 Aug 1846. Both buried UCC cemetery. Christ, born 1854 and John Nicholas, born 1863 were two of their children. Christ Kippenhan, son of Adam Kippenhan and his wife, Margaret N. E. Richter, was born on April 23, 1854 near Kewaskum, Wis. He died Dec. 4, 1935 at his home in Sidney, Mont., following a short illness from pneumonia. He was married to Anna Margaret Klumb in 1876. To this union were born six children, Henry, who died in infancy; Matilda Baumann of Girard; John of Sidney, Idena Decker of Girard; Clara Vollrath of Kent, Wash. and Oscar of Sidney. He also leaves to mourn his passing, a sister and two brothers (one brother being John Nicholas Kippenhan). The latter relatives now reside in Wisconsin. After his marriage he engaged in the hotel and livery business at Kewashkum, Wis., and later moved to Greenwood, in the same state, where he engaged in the lumber business and manufacture of barrel bottoms and staves. The factory was destroyed by fire in 1905. He came to Montana in 1910, taking up a homestead in the Girard community. Funeral services were conducted in Trinity English Lutheran Church. John Nicholas Kippenhan, son of Adam and Magdalena nee Richter Kippenhan. Buried UCC cemetery. Married Mina nee Franz 23 Mar 1887. Mrs. John (Mina) Kippenhan, daughter of Carl and Louisa Franz, was born June 11, 1863 in the Town of Herman, Sheboygan Co, Wis. At the age of 20 years she came to Clark Co with her parents. On March 23, 1887 she was united in marriage with John Kippenhan. To this union 13 children were born. Mr. and Mrs. Kippenhan moved on a farm in the Town of Mead and lived there until 1924, when the moved to Appleton, Wis. She was ailing for some time but her death came suddenly on May 3, 1941. One daughter, Helen (Collins), preceded her in death in 1931. Survivors are the widower, five daughters, Mrs. Lydia Wolf, Pueblo, Colo.; Hilda and Mrs. Emma Wickesberg, Appleton, Wis.; Cilla, Neillsville, Wis. and Louise, Black River Falls, Wis. seven sons, Theodore, Edwin, August, Arthur and Carl, Greenwood, Wis.; John and Roland, Appleton. Funeral services were held at the West Side Church. Mrs. Helen (Kippenhan) Collins, daughter of John and Minnie Kippenhan, was born March 17, 1894. Her early life was spent on a farm near Greenwood, Clark Co. She received her education in the school of District No. 1 in the Town of Mead and in the religious school conducted by the West Side Reformed congregation. She was received into membership of the West Side Reformed Church by the rite of confirmation, April 17, 1908. In the year of 1915 she went to Chicago, where she was engaged in the millinery business. On Dec. 27, 1921 she was united in marriage with Daniel Valentine Collins. They have since made their home in Philadelphia, Pa. Mrs. Collins has been ill for some time but her death came suddenly on Dec. 7, 1931. Besides her husband, she leaves to mourn her death her parents, seven brothers, John and Roland of Appleton, Theodore, Edwin, August, Arthur and Carl of Greenwood and five sisters, Hilda, Louis and Lydia of Appleton; Cilla of Neillsville and Emma of Milwaukee. Mrs. Collins had reached the age of 37 years, 8 months and 20 days. Funeral services were conducted at the Immanuel Reformed Church on the West Side, and interment was made in the West Side Cemetery. Funeral services were held at Valley Funeral Home in Appleton for August Kippenhan, who passed away Dec. 1, 1981 at Menasha. Mr. Kippenhan was born June 18, 1895 to John and Minna (Franz) Kippenhan in the Town of Mead. He farmed on the home farm many years. He later moved to Appleton, where he was employed at P.G. Miron Construction. He never married. He is survived by several brothers and sisters, John, Arthur, Roland, Miss Cilla Kippenhan, Mrs. Herbert (Emma) Wickesburg, all of Appleton, and Mrs. Elmer (Lydia) Wulf of Pueblo, Colo.
Theodore J. Kippenhan, 78, lifelong resident of Greenwood, died November 30 at the Memorial Hospital in Neillsville, where he was admitted following a stroke the day before. Mr. Kippenhan was born January 4th, 1888 in the Town of Mead to John and Minnie (Franz) Kippenhan. He was married June 23, 1915 to Martha Awe at the bride's parent's home in the Town of Green Grove by the pastor of the Immanuel Reformed Church, now the United Church of Christ. He received his education in the Town of Mead School. He worked in logging camps in the winter and farms in the southern part of the Wisc in the summer. After their marriage they settled on a farm seven miles northwest of Greenwood where they farmed for 41 years until they retired from farming in 1956. They lived for five years with their son-in-law and daughter, Mr and Mrs Elmer Meinhardt of Greenwood. They moved to Greenwood in 1961 and had since resided here. Mr. Kippenhan was a member of the Immanuel United Church of Christ, and was a deacon of this church for six years. He was also chairman, treasurer, and assessor for the Town of Mead for a number of years. Surviving are his wife three daughters, Mrs. Emory (Norma) Sieger of Kenosha, Mrs. Elmer (Esther) Meinhardt of Sheboygan Falls, and Mrs. Price (Rosa) Davis of Milwaukee three sons, Alvin and Paul of Greenwood, and Herbert of Wausau; four brothers, August, John, Arthur, and Roland, all of Appleton; five sisters, Miss Hilda and Miss Louise Kippenhan, both of Appleton, Mrs. Herbert (Emma) Wickesburg of Appleton, Mrs. Elmer (Lydia) Wulf of Pueblo, Colo., and Miss Cilla Kippenhan of Neillsville. Funeral services were held from Immanuel United Church in Greenwood. Burial was made in the West Side cemetery. Mrs. Theodore Kippenhan, 74, of Kenosha and recently of Greenwood, died in a Kenosha hospital following a heart attack. Funeral services were held from Immanuel United Church in Greenwood. Burial took place in the West Side cemetery. Mrs. Kippenhan was born July 5, 1893, the daughter of Mr. And Mrs. Henry Awe in the Town of Green Grove. She was married to Theodore Kippenhan June 23, 1915 at the home of her parents. Mr and Mrs. Kippenhan celebrated their golden wedding anniversary in 1965. After their marriage, the couple settled seven miles northwest of Greenwood where they farmed until their retirement in 1956. They made their home with their son-in-law and daughter Mr. And Mrs. Elmer Meinhardt of rural Greenwood, until 1961, when they moved into a residence in Greenwood, where Mr. Kippenhan died in November 1966. In May 1967, Mrs. Kippenhan moved to Kenosha to make her home with a son-in-law and daughter, Mr and Mrs. Emery Sieger. Survivors include: three sons, Alvin and Paul of Greenwood, and Herbert of Wausau; three daughters, Mrs. Emery (Norma) Sieger of Kenosha, Mrs. Elmer (Esther) Meinhardt of Sheboygan Falls, and Mrs. Price (Rosa) Davis of Milwaukee, a brother Arthur Awe, of Owen and a sister, Mrs. Elizabeth Voightlander of Abbotsford. Alvin Kippenhan, 62, rural route Greenwood, Town of Mead, died Dec. 18, 1978, at the Neillsville Memorial Home. Kippenhan, son of Theodore and Martha (nee Awe) Kippenhan, was born Dec. 2, 1916, in the Town of Mead. He was married June 28, 1939 to Emma Williams in the Town of Reseburg. He received his education in the Kippenhan School. For many years he farmed in the Town of Mead. He was a member of the Immanuel United Church of Christ. Surviving him is his wife, one son, Edwin, in the U.S. Navy, stationed in Jacksonville, Fla. three daughters, Mrs. Arthur (Evelyn) Cram of Neillsville, Mrs. Louis (Ethel) Zink, Jr., of Berlin and Mrs. Wendell (Dorothy) Ott of Neillsville one brother, Herbert, Wausau three sisters, Mrs. Emery (Norma) Sleger of Kenosha, Mrs. Elmer (Esther) Meinhardt of Sheboygan Falls and Mrs. Price (Rose) Davis of Milwaukee. Preceding him in death were his parents and one brother, Paul. Funeral services were held from the Immanuel United Church of Christ in Greenwood, with burial in the West Side Cemetery. Funeral services were held at Rinka Funeral Home, Greenwood for Emma Kippenhan, 71, route 2, Greenwood. She died Sept. 18 at Neillsville Memorial Hospital. Burial at Westside Cemetery, Greenwood. Emma Williams was born July 28, 1916 in the town of Reseburg to Rowland H. and Bessie (Thompson) Williams. She was educated in the Goff school. On June 26, 1939, she and Alvin Kippenhan were married in Greenwood. They farmed all their lives in the town of Mead. She was a Farm Bureau leader. Survivors include one son, Edwin (Kip) Kippenhan, Yigo, Guam; three daughters, Mrs. Evelyn Cram, Neillsville; Mrs. Ethel (Louis) Zink Jr., Berlin and Mrs. Dorothy (Wendel) Ott, Neillsville; two brothers, Dewey Williams, Thorp and Walter Williams, Riverton, Wyoming; four sisters, Miss Della Williams, Riverton, Wyoming Mrs. Donald Berthold, Greenwood Mrs. Dalton (Grace) Bartlett, Colorado Springs, Colo. and Ms. Hester Williams, Delta, Colo. She was preceded in death by her husband on Dec. 17, 1978 two brothers and two sisters. Herbert A. Kippenhan, 85, Stevens Point, a former Wausau resident, died April 6, 2003 at St. Michael Hospital, Stevens Point. He was born March 24, 1918 in Clark Co, son of Theodore and Martha (Awe) Kippenhan. On October 22, 1941, he married Helen Hintz. She died December 26, 1976. He married Ramona Prechtel in 1981. She died in 1987. He then married Marie Kostuck-Kruziki on February 10, 1990 in Stevens Point. She survives. Herbert was a World War II Navy veteran as a 1st or 2nd Class Petit Officer, radio technician serving on the USS North Carolina during the battles in the South Pacific. Besides his wives and parents, he was preceded in death by two sisters and three brothers. Funeral services were at St. Paul United Church of Christ, Wausau. Burial was in Restlawn Memorial Park, Wausau. (Information submitted by his son, Kipp Kippenhan, a.k.a. Herbert Kippenhan, Jr.). Services for Mrs. Herbert Kippenhan, 56, 1028 S. Seventh Ave., Wausau, who died in a Madison hospital were held at St. Paul's United Church of Christ, Wausau, and burial was in Restlawn Memorial Park, Wausau. The former Helen Hintz was born Feb. 2, 1921, in Willard, daughter of the late Mr. and Mrs. George Hintz. On Oct. 22, 1941, in Greenwood, she married Herbert Kippenhan, who survives. Survivors beside her husband include a daughter, Mrs. Karen Gault, 1601 E. 10th St., Merrill; a son, Herbert, Jr., Elmhurst, IL; four brothers, Roland Hintz, Willard, Ralph Hintz, Milwaukee, Boyd Hintz, Princeton, and George Hintz, South Holland, IL; and two sisters, Mrs. Kathryn Fravert, Loyal, and Mrs. Bernice Schwartz, Greenwood. Funeral services were conducted at Immanuel United Church of Christ, Greenwood, for Paul Kippenhan, 53, of Route 2, Greenwood, Wis. Mr. Kippenhan passed away June 12, 1978 at his home. Interment was in the West Side Cemetery. Paul Kippenhan was born to Theodore and Martha Kippenhan on May 3, 1925 in the Town of Mead and received his education at Kippenhan School. He was a Korean Veteran, serving in the Army from Feb. 27, 1951 until Feb. 4, 1953. On Aug. 14, 1954, he was married to Julia Scheel in Neillsville. They farmed in the Town of Mead until the fall of 1965, when they purchased the tavern, known as Kippenhan's Tavern, and operated it until his death. Survivors include his wife, Julia two brothers, Alvin of Greenwood; and Herbert of Wausau; and three sisters, Mrs. Emmery (Norma) Sieger of Kenosha; Mrs. Elmer (Esther) Meinhardt of Sheboygan Falls; and Mrs. Price (Rosa) David of Milwaukee. Donald Kippenhan, 60, a resident of Memorial Home, Neillsville, for two years, passed away Oct. 23, 1976 at the Neillsville Memorial Home. Funeral Services for Donald Kippenhan were held at Immanuel United Church of Christ, and burial was made in the West Side Cemetery. Donald Kippenhan was born on Oct. 14, 1916, in the Town of Mead to Edwin and Lena Reinhart. He received his education in the Town of Mead and was never married. He worked for Plautz Brothers for about five years, he was a driver of a grader for the county for a number of years, and spent his last five years doing farm work. He is survived by one sister, Mrs. Ralph (Malinda) Hintz, Milwaukee, and two brothers, George, Greenwood, and Calvin, Appleton. He was preceded in death by one sister and his parents. George E. Kippenhan Sr., 63, of Town of Weston, died at his home Nov. 12, 1983. Funeral services were at Immanuel United Church of Christ, Greenwood. Interment was in the West Side Cemetery. George Kippenhan was born to Edwin and Lena (nee Reinhardt) Kippenhan, on March 13, 1920, in the Town of Mead. He received his education at Kippenhan School, rural Greenwood. He entered the Army in 1942, and served in the European Theatre. He returned to his parent's farm after his discharge. On Sept. 17, 1955, he was married to Ruth Schofield (Ruth nee Radtke 28 July 1924 - 21 Feb 1997, previously m. Clayton Scholfield in 1940) at Greenwood. After their marriage, they purchased a farm in the Town of Weston. He was a World War II veteran and a member of the United Church of Christ. Full military rites were conducted at the funeral by the Greenwood American Legion. Survivors include his wife, Ruth two sons, George Jr. and Roger of Muskego; one daughter, Shirley, at home seven step-children, Mrs. Betty Bach of Stevens Point, Mrs. Warner (Carol) Weiland of Muskego, Gerald and Glenn Schofield, both of Milwaukee, Verland and James Schofield of Muskego and Mrs. Edward (Cathy) Vetrone of Milwaukee one brother, Calvin of Appleton. Preceding him in death besides his parents, were one brother and one sister. Gladys Kippenhan, 16-year-old daughter of Mr. and Mrs. Edwin Kippenhan, died at Luther Hospital, Eau Claire, where she had been a patient since Oct. 26. She had been ill the past two years, the result of Bright's Disease (kidney disease). Gladys, daughter of Edwin and Lena Kippenhan, was born March 16, 1927, on the farm where the Kippenhans now reside, 7 miles northwest of Greenwood in the Town of Mead. She attended Kippenhan School, Town of Mead, and was confirmed at West Side Immanuel Reformed Church two weeks before she became ill two years ago. Arthur Kippenhan, 85, Appleton, died July 27, 1989. Services were held at St. James Methodist Church, Appleton. Arthur Kippenhan was born on Jan. 7, 1904, in Greenwood, Clark Co. He was a member of St. James Methodist Church and the Loyal Order of the Moose. For the past 36 years he has been a resident of the Appleton area. Survivors include his wife, Lucille (Stammer) Kippenhan, two daughters, Mrs. Albert (Joanne) Sollecito, Hopewell Junction, N.Y.; Mrs. Virgil (Janet) Van Asten, Appleton; three sons, B. William, Raleigh, N.C.; Cecil, Chippewa Falls; and Kenneth (obit below), Preciosa, Germany (no "Preciosa" found in Germany, only in Brazil); two brothers, John and Roland, Appleton; two sisters, Cilla Kippenhan, Appleton; and Mrs. Elmer (Lydia) Wulf, Pueblo, Col.
Ingebert Kolstad married on 12 Oct 1879 to Karen nee ? (29 May 1844 - 10 Feb 1933) Both buried Greenwood cemetery. A quiet and very pretty double wedding took place at the home of Mrs. Karen Kolstad, one mile north of Greenwood on June 15, 1910. The contracting parties were Emil Kolstad and Mrs. Alma Rosen (nee Anderson, previously married to Andrew Rosen, Greenwood cemetery = infant girl 10 June 1903 - 5 Oct 1903); Victor Krokson and Miss Julia Kolstad. They were attended by Miss Edna Burch as maid of honor, and Axel Krokson as best man. Mr. and Mrs. Kolstad will remain of the farm just north of town, and Mr. and Mrs. Krokson will make their home for the present in the Albert Johnstone residence on Begley Street. Mrs. Christina M. Moberg, 78, a native of Sweden, but a resident of Greenwood for the past 56 years, died Mar. 15, 1950 at the home of her son and daughter-in-law, Mrs and Mrs. Elery Moberg, in Neillsville. Mrs. Moberg was born March 19, 1871 in Haevo, Sweden, the daughter of Mr. and Mrs. Andrew Anderson. She came to Greenwood from Sweden in June of 1894 and had lived here ever since. Her husband, Ole Moberg, preceded her in death in 1928... Mrs. Emil (Alma) Kolstad, Greenwood, and Anna Moberg, Sweden, sisters, and Eric Moberg, also of Sweden, are other survivors. Everett Kolstad, 95, Sioux Falls, S.D., Jan. 31, 2007, at Greenleaf Assisted Living Center. Funeral services were at the Heritage Funeral Home Chapel, Sioux Falls, SD. Interment followed at Woodlawn Cemetery. Everett Kolstad was born Nov. 30, 1911, in Greenwood, to Emil and Alma nee (Anderson) Kolstad. He was raised in Greenwood. He moved to a farm outside Greenwood in 1921, where he worked for his aunt and uncle Victor Krokson for 15 years. He then moved to Sioux Falls where he lived with his older half-brother, Olaf Rosen, and his wife, Minnie, while he worked for a short time for John Morrell & Co. He married Myrtle Fordahl on June 23, 1939. He served in World War ll. Upon returning to Sioux Falls, he worked as a farmer for a short time. He then worked for Mid-America Energy as a service technician until his retirement. He enjoyed bowling, participating in several Midwest bowling tournaments, and dancing, especially the two-step. He was also a member of the Sons of Norway and Peace Lutheran Church. Survivors include his wife Myrtle; a brother, Art, Willard. Julia, daughter of Ingebert and Karen Kolstad. Married Victor Krokson 15 June 1910. Buried Greenwood cemetery. Victor Theodore Krokson, 78, died of a stroke Dec. 28, 1954 at his home. He had been in ill health the past several years. Mr. Krokson was born Nov. 9, 1876, in Sweden, and in 1910 was married here to Julia Kolstad. The couple resided on a farm in the Town of Warner until seven years ago, when they retired and came to the city. Mr. Krokson is survived by his wife and three brothers, Morris Krokson, Greenwood; Fred Krokson, St. Petersburg, Fla. and Oscar Krokson, Osage, Minn. Three brothers and a sister preceded him in death. Funeral service at Our Savior's Lutheran Church and burial in the Greenwood Cemetery.